A $9 million, six years-in-the-making project to redevelop the northern part of Burlington's waterfront began Tuesday. In March, Queen City voters approved a plan to use tax increment financing (TIF) to help fund six major projects on the waterfront. 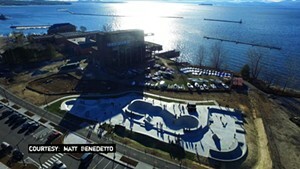 The "Waterfront Access North" construction — which includes building a new skatepark and doctoring a "decayed and disjointed" stretch of the bike path — is the first to get underway. Standing amidst the gravel and overgrown Queen Anne's lace next to the defunct Moran Plant (the subject of another of the projects), Mayor Miro Weinberger called the ground-breaking a "historic and long-awaited day" and described the project as the most significant waterfront development undertaken in the last two decades. In addition to the skatepark and the bike path renovations, the city will extend Lake Street, bury the nearby utility lines, install a new storm-water runoff system and do environmental remediation work. The project is drawing on 20 different sources of funding — "each with their own rules and strings attached," according to Weinberger. The complexity of the financing — along with the site's environmental contamination — slowed down the project, he said. The bulk of the funding will come from tax increment financing ($4 million) and the federal government — the Departments of Transportation and Housing and Urban Development are collectively chipping in nearly $4 million. Weinberger made a point of mentioning that only $300,000 would come straight out of the city coffers. 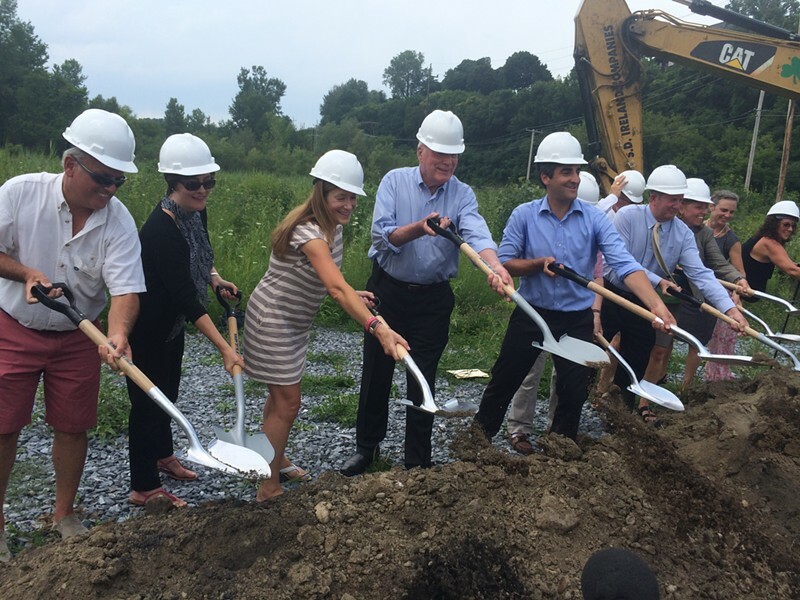 Public officials, including U.S. Sen. Patrick Leahy (D-Vt.), who has a long track record of securing federal dollars for work on Burlington's waterfront, marked the occasion with the mayor. Leahy said he enjoys his senior seat on the Appropriations Committee — which makes him well-positioned to designate dollars for Vermont projects — "but only because I know that you're going to do it well." The project is expected to be finished by the end of 2015. The other TIF-funded projects are still in the planning stages. They entail expanding the marina, building a permanent home for the Community Sailing Center, upgrading the Waterfront Park, creating a "Sustainability Park" at the ECHO Center and renovating the Moran Plant — if the developers can drum up enough private money to supplement the public funding. All together, the projects rely on $9.6 million in TIF funding and $33 million in private investments.